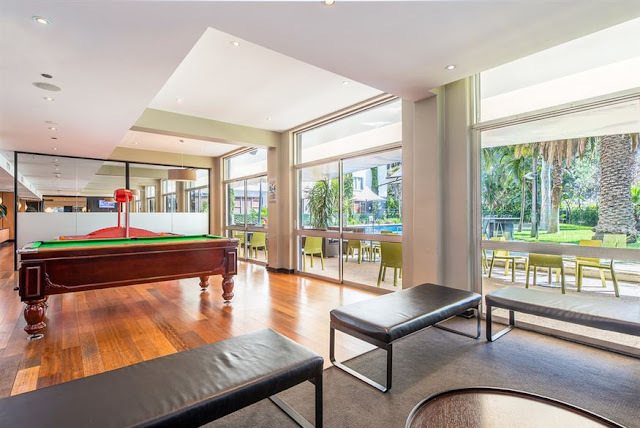 Staying at local hotels when you're interstate for work and discovering new gems is such a treat, and a fun way to get to know the suburb you're in. This can be said of the hotel stay for Josie's Juice at BreakFree Bell City. 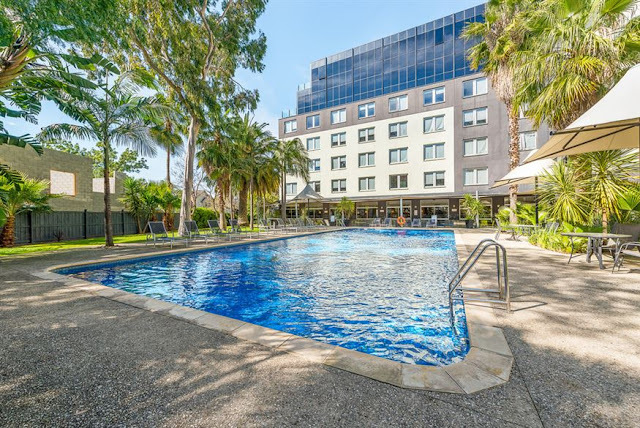 Located at 205 Bell Street, Preston, here is a ready reckoner to its location: 9km to Melbourne CBD, 9.9km to Melbourne Cricket Ground (MCG), 10.4km to Federation Square, 10.6km to Royal Botanic Gardens, 10.8km to Queen Victoria Market and 17.3km to Crown Casino. The hotel is also 20 minutes from Melbourne airport, and is quite simply excellent value for money. Public transport is on the doorstep with the train, tram and bus stop within 5 minutes’ walk, a complimentary weekday shuttle to the CBD and surrounding universities is also available so you can explore the city’s best attractions and get the most out of your Melbourne holiday. Josie's Juice loves the idea of a less exy hotel, where you can have your base for a few days, and drop some cash on a cab or two, but enjoy the comforts of a lovely clean room, and... that city scape view! A bit of history: the Preston & Northcote Community Hospital (often referred to as PANCH) was the former hospital located at this very site - it opened in 1958 and relocated to the Northern Hospital in Epping in February 1998. 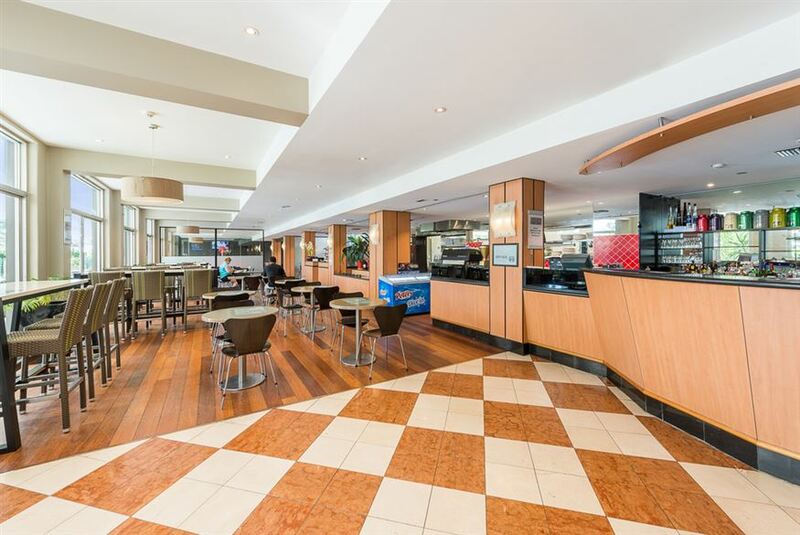 PANCH was located on the corner of Bell and Hotham Streets, and the site was sold off in April 1999, and part of the 30,000-square-metre (320,000 sq ft) site is now occupied by Bell City Centre which is a residential facility, student accommodation and host of two hotels apart of the Mantra Group. There is much to enjoy in the city of Preston - Sonny's Bottega is our new fave spot (this post has been updated since originally published, and Sonny's Bottega opened in November 2017). Up the road from Preston is Northcote where you'll find lots of great eats. The most obvious is 'Welcome To Thornbury' food truck park. 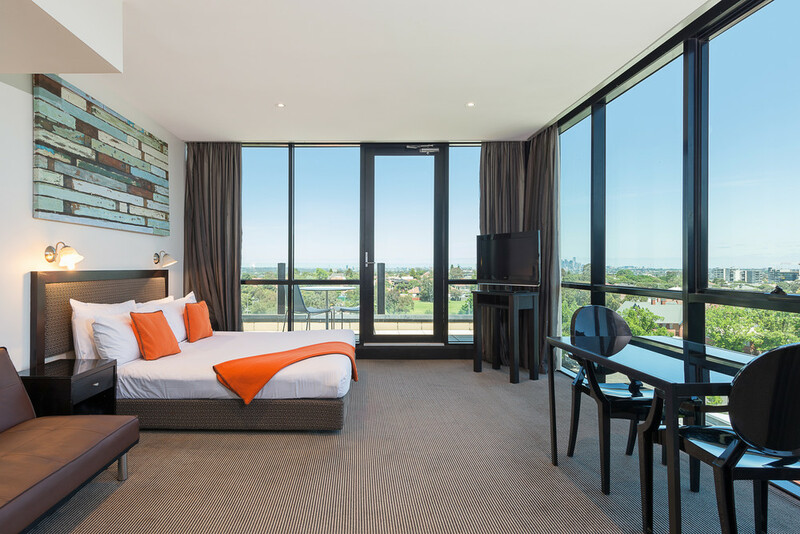 Back to the rooms: every room has WIFI, and rooms have been designed with an ensuite bathroom and are furnished with a work desk and LCD TV with Foxtel, and tea and coffee making facilities. There is no room service however - you'll need to come downstairs to dine at JD’s Diner & Bar. Wagyu beef burger, chicken schnitzel roll, vegetarian coconut laksa soup, stir fry hokkien noodles, Memphis smokey BBQ pork roll, gourmet hot dogs and more. It's adjacent to the hotel pool and it's a great place unwind, even if you're not going for a swim. There is also a hotel sauna and gym. Plus, there’s also the games room and an outdoor BBQ area so you can cook for your visiting buddies. In keeping with the casual quarters of the hotel, you can use the shared kitchen to make a quick snack or meal on the run. See, it's different from your average hotel. Want to dress up a bit and go for dinner within walking distance? 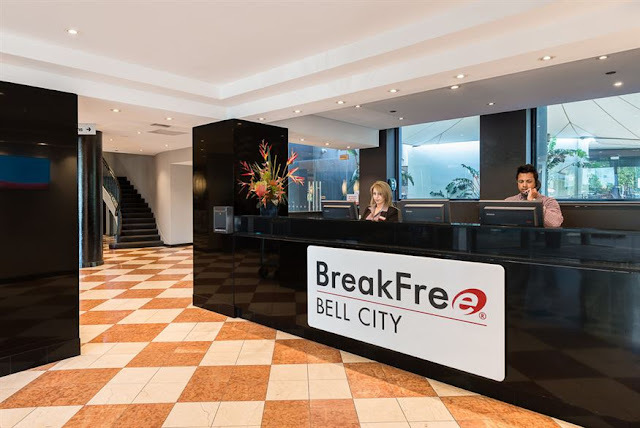 Go to Chill, essentially in the same quarter of BreakFree, located at Mantra hotel. Here is the dinner menu. And here is a taster: grilled salmon, shaved fennel and citrus salad, almond fritter, salmon pearls; house made pan fried potato gnocchi, asparagus, sage, burnt butter, brioche crumble; chicken involtini, yellow maize, green beans, parsnip, feta and basil, shallot jus; twice baked lamb shoulder, buttered mash potato, glazed shallots, red wine jus; barramundi, baby leeks, burnt lemon, parsnip crème, balsamic reduction; roast pork tenderloin, apple, cabbage and port raisin jus; slow braised beef cheek, buttered kale, potato mash and salsa verde; eggplant caponata, crisp polenta sticks, tomato sugo, fried basil and pine nuts. Saturday and Sunday breakfast is from 6am to 10.30am. Lunch is from 12pm to 3pm, and dinner is from 5.30pm to 9.30pm. Call 03 9485 0088 for more info or bookings. Josie's Juice loves a selfie... it has to happen!